Many recipes can benefit from cooking with alcohol. We look at seven dishes you can make at home that take advantage of the transformative powers of Madeira, Marsala wine, Sherry, Cognac, whiskey and Grand Marnier. It’s no secret that many restaurant recipes, from sauces to a quick deglaze, start with a splash of dry wine. Alcohol creates significant transformations during cooking. 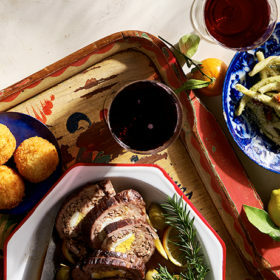 But in many cases, particularly in classic French recipes, fortified wines and spirits form the unique flavors that many diners can’t quite place. What gives these wines and spirits an advantage in cooking is that their flavor profiles are already very complex. They can do a lot of work with minimal effort. Drinks like Madeira, Port and Marsala are usually corralled under the dessert section of a restaurant list or wine store, but most aren’t as sweet as people think. However, fortified wines have more concentrated flavors, often making them less versatile for food pairings compared to dry table wines. Never pour alcohol straight from the bottle into the pan. Instead, measure the desired quantity before cooking, and add it once the pan has been removed from direct heat. These extra flavors come from oxidation, residual sugar, added grape must and/or barrel aging. They can make charming liaisons between disparate ingredients in a recipe. Alcohol is also an excellent solvent for flavor, both when it dissolves the concentrated fond at the bottom of a pan when searing meat, or as a base for an extract. Another benefit is shelf life. Spirits last almost indefinitely, and most wines fortified with alcohol or exposed to oxygen or heat will stay fresh much longer than their counterparts. When cooking with alcohol, there are some precautions to take, as alcohol vapors may catch fire. Never pour these straight from the bottle into the pan. Instead, measure the desired quantity before cooking, and add it once the pan has been removed from direct heat. When you return the pan to the stovetop, the sauce may still produce small flames, but it should be safe. Spirits like brandy and rum are especially prone to ignite, in comparison to fortified wines. If you want to confirm that all flammable liquor has burned off, use a long-handled lighter to encourage any remaining fumes to ignite. Sometimes there won’t be flames at all, and that’s okay, as the alcohol is still evaporating as the sauce cooks. Here are some classic recipes to experiment with that use common fortified wines and spirits. Despite its name, there’s no dairy involved in a “cream” Sherry—the name just tells you this is a fairly sweet wine. Cream sherry is blended from a combination of oxidative-but-dry oloroso, sweetened by Pedro Ximénez and/or grape must, so it’s packed with flavor, acidity and enough sugar to reduce into a delicious syrup. Treat this glaze like barbecue sauce or teriyaki. Here it coats browned chicken thighs, but it’s also impressive when tossed with crisp roasted chicken wings. Any leftover sauce will keep it in the refrigerator for at least a month, so try it spooned on a cheese plate or as a fun update to a grilled cheese sandwich. This straightforward recipe uses an entire 750ml bottle, but won’t break the bank. Cream Sherry is commonly found for $15 or less. Pour Sherry into saucepan. Boil over medium-high heat until reduced down to ½ cup, about 40 minutes to 1 hour, depending on pot width. Near completion, sugar will be more concentrated, and reduction quick to burn. Transfer reduction to glass jar or bowl. The reduction will thicken as it cools. The final sauce should be thick yet pour freely, like dark maple syrup. Pat chicken thighs dry, and season with salt and pepper. Arrange, skin side down, in cold cast-iron pan. Cook over medium-high heat for 13–15 minutes, and don’t move thighs in pan. If thighs seem to cook too quickly, reduce temperature and rotate pan to even out hot spots. When ready, the skin should be crisp and thighs should provide very little resistance to being lifted. Flip thighs, and drain off excess fat. Spread 1 tablespoon of glaze evenly on each thigh with back of spoon. Move pan to oven and bake for 10 minutes. Remove chicken, and let rest for 5 minutes. Sprinkle olives and sliced lemon over chicken, and plate. Serves 4. A bottle of Grand Marnier is a staple of many home bars, but this orange-infused brandy can pull double duty in the kitchen. The liqueur’s ability to convey round, aromatic citrus flavor is endlessly useful in desserts and can give fruity notes to a savory sauce. This recipe for Suzette sauce uses orange-infused brandy liqueur along with fresh-squeezed orange juice to add zest and character. A few tablespoons of caramelized sugar bring complexity to the sweetness, and butter whisked in at the end provides a richness that will taste magnificent on crepes, waffles or French toast. Caramelize sugar by adding to dry skillet in an even layer and heating over medium-low heat until crystals start to melt. Swirl occasionally as the color of the liquid changes from clear to golden-brown caramel. Be careful: caramel can burn easily as it changes color. Add orange juice to pan over medium-high heat. Stir until caramel dissolves. Once dissolved, add lemon juice. Whisk in butter 1 tablespoon at a time until incorporated. Remove pan from heat and add Grand Marnier. Stir well, and return to medium-high heat. Sauce may flambé, but flames should subside quickly. Bring to rolling boil. Add salt, and stir until mixture thickens enough to coat spoon, roughly 3–4 minutes. For crepes Suzette, dip crepe in pan, flip, fold in quarters and plate. Sauce can coat 8–10 crepes. Madeira can last practically forever without any refrigeration. At higher prices, this fortified wine is sold by vintage and grape variety, in varying degrees of complexity and sweetness and is best saved for sipping. However, Madeira labeled “rainwater” can be perfect for cooking. Rainwater Madeira is produced in larger quantities than vintage bottlings. It’s significantly lower in price, though still tasty enough to drink. Broadbent and Henriques & Henriques are good brands whose rainwater Madeira can be found for less than $20. Rainwater Madeira is medium-dry with a nutty, oxidative edge that plays well with garlic and the earthy funk of mushrooms. Serve this hearty sauce with risotto or eggs, or double the recipe and layer with béchamel, Parmigiano and sheets of pasta for an elegant vegetarian lasagna. Add mushrooms to dry pan over medium-high heat. Stir occasionally until liquid from mushrooms evaporates. Cook until almost dry. Remove mushrooms, and place in bowl. In same pan over medium heat, add butter, and stir until melted. Add carrots, celery and onion, and cook until soft and beginning to brown. Return mushrooms to pan. Add garlic, bay leaf, thyme, salt and pepper. Remove pan from heat, and allow to cool briefly. Add Madeira. Stir and return mixture to rolling boil. Cook until sauce thickens, about 5 minutes, or until alcohol can no longer be smelled. Add ¼–½ cup water, depending on desired thickness. Add salt, if necessary. Stir in chopped parsley, and serve. Serves 2–3 as side dish or sauce. The secret ingredient for many a French bistro? A splash of Cognac in your food. Cooking with Cognac brings a touch of spice, vanilla and fruit, and when used properly, it leaves food that doesn’t taste like brandy yet still retains the spirit’s background level of complexity. The cooking process is also rather quick, unlike deglazing with wine, where a sauce may need to cook for a while to not taste overwhelmingly fruity or tart. Affordable Cognacs and Armagnacs can run $30–$40 a bottle, though smaller formats are also available if you don’t want to commit to a full bottle for a single recipe. Other aged grape brandies can be substituted, but cheap ones can be too sweet and woody. A good rule of thumb is to use something balanced enough to drink. Crush peppercorns with mortar and pestle, or grind with rolling pin. Form ground beef into patty. Season both sides of patty with salt and 1 teaspoon crushed peppercorns, reserving rest. Coat patty with grapeseed oil. In frying pan over high heat, sear both sides of patty to desired level of doneness, about 5 minutes per side for medium-rare. Remove burger, and rest on paper towel. Remove excess oil from pan, and return to medium-high heat. Add butter and sliced shallot to pan. Cook until shallot softens, about 1 minute. Remove pan from heat, and allow to cool for 30 seconds. Add Cognac and return to heat. Bring to simmer. Stir and scrape bottom of pan to deglaze and create sauce. Simmer for 1–2 minutes, until Cognac reduces by about half. Add cream and remaining pepper. Simmer for 1 minute, stirring constantly. Remove from heat. Add parsley, as well as salt, if desired. Arrange burger on bun, and pour au poivre sauce on top. Garnish with additional shallot, sliced tomato and/or Dijon mustard, if desired. Serves 1. There’s something unmistakable about the aroma of rum, which has always been a popular ingredient for bakers and pastry chefs. The spirit is probably best known as a key ingredient in bananas Foster, where it’s flambéed with bananas and brown sugar to take advantage of the fruit and caramel notes of dark rum. But as many cocktail fans know, rum has an affinity for fresh fruit. This rum-fortified syrup can turn a fruit salad into the surprise hit of any meal. It’s a lovely treatment for firm tropical fruits just short of ripeness, as the rum coaxes out their full potential. Mango, kiwi and papaya are all good candidates. Chopping the fruit into a small dice may seem fussy, but it allows the flavors to permeate easier and elevates the experience. Any rum can be used with this recipe. However, a dark rum will develop a richer flavor, while white rum or an unaged agricole will highlight the brightness and acidity in the fruit. Refrigerated with the syrup, the fruit should last 24–48 hours, depending on its initial ripeness. Fill pot with 1½ cup water. Add sugar and vanilla bean, and bring to boil. Reduce heat, and simmer for 3–5 minutes. Remove from heat. Stir in rum and let cool. Place diced pineapple into a 2-quart jar. Top with syrup and seal. Refrigerate for at least 3 hours. Steeped fruit and syrup can be served alone, or with ice cream, panna cotta or yogurt. Serves 4–6. Many types of whiskey can be used in a caramel sauce, though rye is a good choice because of its inherent spice. In addition to caramel and vanilla flavors common to all barrel-aged spirits, rye grain offers a deeper flavor with a distinctive note of allspice. A few dashes of bitters rounds out the whiskey’s spice with additional notes of clove. Bananas are great foils to the spicy-sweet flavor of this caramel sauce, though it’s also hard to beat atop classic vanilla ice cream. In saucepot, melt butter over low heat. Add sugar, heavy cream and corn syrup. Cook for 5 minutes, stirring occasionally. Remove pot from heat, and add ⅓ cup rye whiskey. Return to medium-high heat, and whisk vigorously to combine. Cook for 5 minutes, stirring frequently. Remove from heat. Add salt, bitters and remaining whiskey. Let cool for at least 10 minutes to let sauce thicken. Leftover caramel will keep refrigerated for 2 weeks. Makes about 1 cup.